Looking for the best hardwood floor refinishing Denver CO has to offer? Fabulous Floors is an affordable and premium wood floor refinishing company in Denver. We understand that your hardwood floors are an investment, and we respect that. We want your floors to look just as beautiful as the rest of your home. Trust the experts at Fabulous Floors Denver to provide you with a professional wood floor refinishing service in Denver, CO. Our eager technicians are certified for all hardwood floor work. Call us soon to set up a visit and learn just how Fabulous Floors Denver gets their fabulous name. Not only do we provide the best hardwood floor refinishing in Denver, CO, but our prices are pretty great too. Call today to learn more about our wood floor refinishing service! Step 1. Remove Carpet – The first thing we do is to remove any carpet that may be present. With precision and care, we make sure that any remnants of the carpet or pad are completely removed. Step 2. Sanding – We have powerful sanding equipment that is virtually dustless. Any mess we do create, we are sure to clean up. This process works well in removing the scratches, nicks, or dings that may have occurred on your hardwood floors. We’ll even sand those hard to reach spots by hand. Step 3. Staining – Once your floors are all smooth, they are ready to be stained. We have a large selection of over 25 color options of stain for you to choose from. We can help you decide which stain will match your decor the best or which color will look nice in your home if you’re looking to change things up. Step 4. 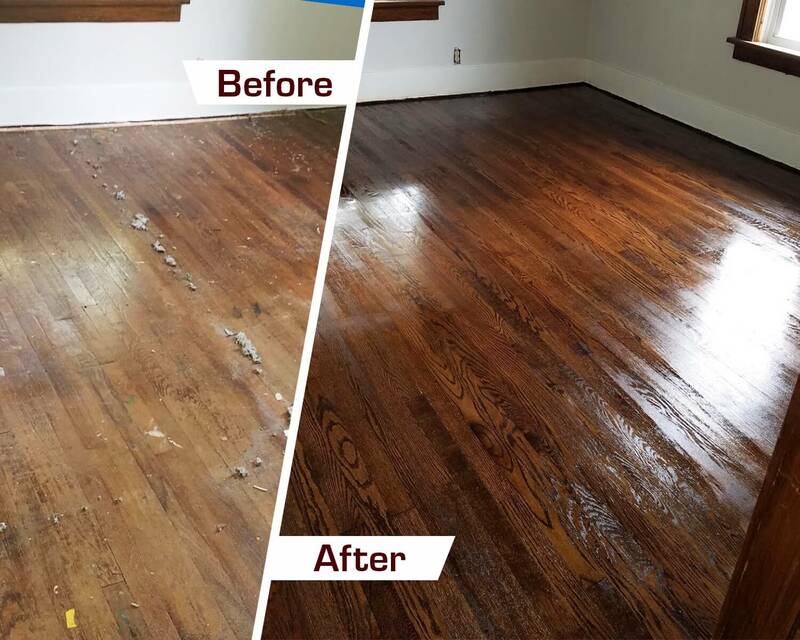 Finishing – The last important step is to apply our long-lasting polyurethane finish to your hardwood floors to complete the refinishing process. This extra layer of protection for your hardwood floors give them a nice look and helps them stay beautiful for the years to come. Fabulous Floors have gone to great lengths to ensure that our process and services are safe for everyone involved, including the environment. We live in Denver too, and wouldn’t want to do anything that might harm the environment around us. We also care about our employees, and your family, home, and pets. Our services and materials have all passed strict environmental standards and have been labeled as GREENGUARD Certified.